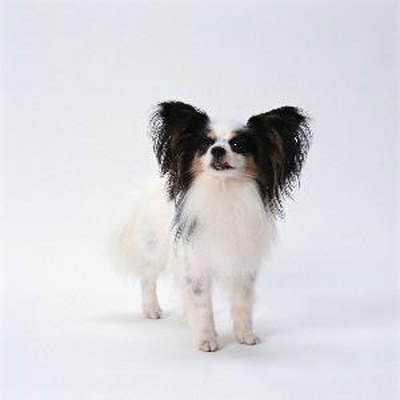 All purebred dogs, papillons included, have genetic conditions they are prone to. It is traumatic to witness your dog experiencing a seizure -- especially for the first time. Different breeds are prone to different health concerns, particularly purebred dogs. If you have a papillon, knowing the conditions she is predisposed to will prepare you for the possibilities. Seizures aren't on any lists of known papillon health issues. Although they aren't a primary problem, there are conditions that can result in seizures that you should still remain aware of. Although epilepsy is the most commonly known cause, other issues can also make a papillon have a seizure. Brain tumors, thyroid problems, distemper, poisoning and low blood sugar can all bring on a seizure. Because hypoglycemia is a concern for papillons, maintaining your dog's blood sugar should eliminate that as a potential danger. If your previously healthy papillon has a seizure, take her to the vet as soon as possible. It could be an indication of an underlying condition. The papillon breed does have a list of genetic health concerns that pappy parents should watch for. Things like luxating patella (knee problems), deafness, dental problems, low blood sugar and retinal atrophy are the known health issues for papillons. Michele Welton wrote the book -- well, one of the books -- on purebred dogs. On her website, she lists injury as one of the leading health issues for toy dogs, papillons included. If your papillon jumps off of the furniture or accidentally falls from your arms, she can break a bone or hit her head, causing a concussion. Being small dogs, they can choke on even the smallest objects, and toxic substances will have an amplified effect on their tiny systems. Larger dogs can easily hurt them, even in play, and the crack between the boards in your fence may be big enough for your small pappy to squeeze through. Always be vigilant in handling your papillon and maintaining her environment.